Whenever we are to multiply two numbers then most of the time we undergo long calculations , and if we have to do easy calculation then we were lucky. But what to do when we have to multiply two numbers in very short time. Suppose we have to multiply 32 with 11 then it is easy, because just put right most digit as it is and then increase every digit by one to left and at last put the left most digit as it is and put 352 as answer. Multiply Right most digits 8 and 7 with each other to get product 56. So keep 6 as right most digits of answer and 5 as carry forward to next step. Now add the product of Outer most ( 7 with 7 ) and Inner most (8 with 5 ) digits ,and add the carry forwarded number from previous step 1. i.e. ( 7×7 ) + (8 ×5 ) = 49 + 40 = 89 + 5( Carry from previous step ) = 94. So keep 4 as second digit from right of answer and 9 as carry forward to next step. Now Multiply Left Most digits 7 and 5 to get product 35, Add the carry forwarded number 9 from previous step to 35 to get 44. Put this number 44 as 3rd and 4th digits from right of the answer. 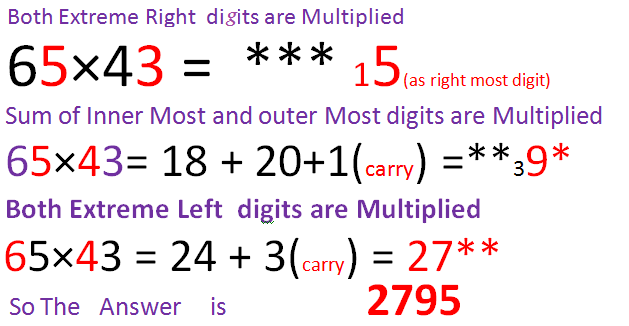 This post was regarding short cut method of Multiplying two and digits Numbers , Please share your precious views on this topic, and follow me on my blog to boost me to perform better, we shall meet in the next post , till then BYE . If you liked this post , share it with your friends through social media site (Whats app , Facebook etc ). Let us learn Multiplication , division , arithmetic and simplification short cut ,tips and tricks after buying this Book of Magical Mathematics .